Ash trees; mostly Green Ash, but can infest all other species of Ash. Feeding by the larvae (there can be hundreds even thousands in a single tree) cuts off the flow of nutrients which kills branches and eventually kills the tree. As the branches begin to die the foliage turns yellow, wilts and falls off leaving bare branches. The crown becomes very thin, there is a diminished density of leaves and epicormic shoots (also called water sprouts or witches brooms) are produced along the trunk of the tree down to the base. Vertical splits or cracks in the bark over larval galleries are commonly seen on the trunk and branches of infested trees. The bark over a gallery turns pinkish brown and dries. D-shaped emergence holes are an indicator of infestation. When a tree is infested, birds and other animals can further damage the bark to feed on the larvae. Peeling the bark away from the tree will reveal several serpentine galleries. The new adults feed on the leaves and cut notches on the side of the leaf Causing the canopy to appear ragged. 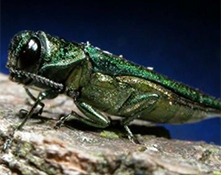 Ash trees killed by Emerald Ash Borer lose their structural integrity and become prone to failure very quickly. 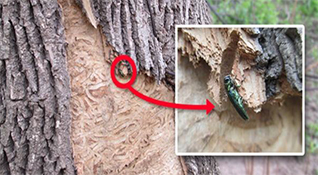 The Emerald Ash Borer has four life stages; adult, egg, larva, and pupa. The adult has a shiny emerald or coppery green-coloured body. 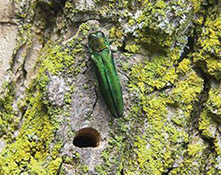 Adults can be seen on or near ash trees from early June to the end of August. They feed along the margins of ash leaves, they mate and then the females deposit their eggs singly in bark crevices or under bark scales. The larvae feed between the sapwood and bark along the entire length of the trunk and on branches more than 2cms in diameter. They can be found during the summer months. Most of the population spends the winter in the pupal stage. The only treatments to help reduce the risk of infestation in Ontario are trunk injected methods. At Four Seasons Tree Care we have chosen to use TreeAzin®. Once a tree is heavily infested, removal is the only option.